The best entertaining advice I can bestow upon anyone is to begin by admitting your shortcomings. If one can recognize they lack certain talents, then let the experts handle those elements of the party. Can’t bake? Then don’t attempt the multi-layered pastry confection that looked great on Pinterest, but will end in fondants of tears and wasted funds. Bad at decorating? Have some friends over to deck those halls. Not quite skilled in the bartending arts? Make a punch! While I fully appreciate a great cocktail, love writing about them and enjoy hosting guests, in reality I’m a hopeless bartender because I’ve never mastered the art of chatting and properly mixing drinks simultaneously. So instead of rudely ssshhhhing anyone while I attempt to fix them a libation as I concentrate on the measurements, I make punch. Besides, not only is something served in a punchbowl relatively simple to batch up and maintain, it’s festive, welcoming and makes a pretty centerpiece. Then I feel more comfortable spending time with my guests who get the first ladle on the house as we do the catching up, and are welcome to help themselves after that if I’m busy tending to other things. Also, it’s a fun way to play with different combinations of base spirits, juices and syrups. Here’s one I like this time of year because it’s easy to make and it’s a true crowdpleaser. Plus it’s got the sparkle from the fizzy wine and wintry spice from a syrup with a fetching, red hue. The name comes from Good King Wenceslas, one of the most welcoming of carols because the 19th century lyrics make no reference to the nativity (music nerd fun fact: the lyrics were written in by British hymn lyricist John Mason Neale in 1853, centuries after the melody, which is of 16th century Finnish descent.) Let’s drink, sing and celebrate - 2016 is almost over! Neat trick: if one can remember, freeze a small bowl overnight to make one giant ice cube for the punch so it doesn’t dilute too quickly. 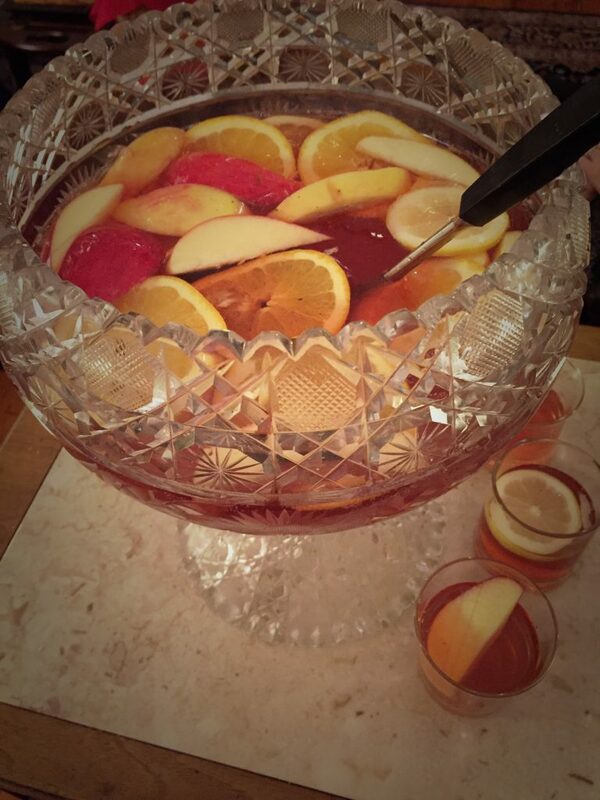 Just plonk all the liquids in a decent looking punch bowl, or something you aren’t ashamed of having on display as an equivalent, give them a stir, add ice and fresh fruit to dress it up. Ladle into cups and enjoy your company! Add the water, hibiscus and spices to a small pot and bring to boil. When it has come to a full boil, remove from heat and let the flowers steep in the liquid for about 15-20 minutes. Strain the flowers out of the liquid and return it to the pot with the sugar. Heat it to a boil again while stirring to dissolve the sugar. Simmer until the mixture gets syrupy, another few minutes. Allow to cool before using. Stores for about 10 days in the fridge in a sealed container. *Need some ideas about which spirits to use in the punch? Check out the winners list from the 2016 NY International Spirits Competition for inspiration! A version of this recipe was also featured in Buzzfeed UK here.